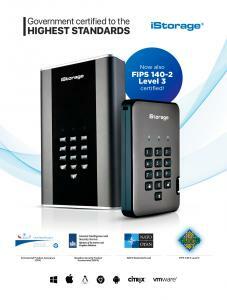 PERIVALE, MIDDLESEX, UNITED KINGDOM, December 5, 2018 /EINPresswire.com/ — (London, Dec, 2018), iStorage, the award-winning and trusted global leader of PIN authenticated, hardware encrypted data storage devices, is delighted to announce that their diskAshur PRO² portable HDD/SSD and diskAshur DT² desktop HDD are now FIPS 140-2 Level 3 certified after months of rigorous tests. This is in addition to recent news announced only a few months ago that both products were certified to NCSC CPA, NLNCSA BSPA & NATO Restricted Level, making iStorage the world’s first and only company to have all these certifications. 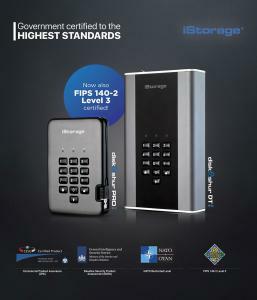 If you would like to request a free 30 day evaluation, please contact evaluation@istorage-uk.com, alternatively for more information on the diskAshur PRO², diskAshur PRO² SSD and the diskAshur DT² or to find out how the iStorage range can help protect your organisation’s confidential data, whilst ensuring GDPR compliance, please visit www.istorage-uk.com or contact +44 (0) 20 8991 6260.
iStorage is the trusted global leader of award winning PIN authenticated, hardware encrypted data storage devices. Delivering the most innovative products to securely store and protect data to military specified encryption levels; safeguarding valuable business information whilst ensuring compliance to regulations and directives. Industry Awards won: 2013 UK IT Industry Awards Winner, 2015 UK IT Industry Awards Winner, Computing Security Excellence 2016 Awards SME Solution Award Winner, 2017 UK IT Industry Awards – Highly Commended, PC PRO Security Product of the Year 2017 for diskAshur PRO² and 2018 Security Today Magazine New Product of the Year – Winner in the Tools and Hardware Category. iStorage is also featured on The Hiscox Sunday Times Tech Track 100 2016 List of Britain’s fastest growing tech companies, FT 1000 Europe’s Fastest Growing Companies 2017, London Stock Exchange Group’s 1000 companies to Inspire Britain 2018, 2018 FT Future 100 UK list of the fast-growing businesses that are shaping the future of their sector and making positive impact on business and society. 2018, John Michael is named as one of the top 100 most influential Black, Asian Minority Ethnic (BAME) leaders in the UK tech sector.